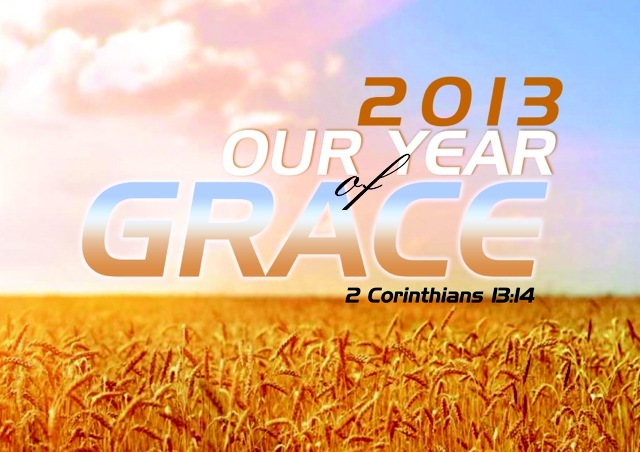 Say this out loud, 2013 is my year of grace, grace and more grace. Therefore, I will be graced and not disgraced. In 2013 I will enjoy unmerited favour, I will experience preferential treatment, I will be provided for with advantages, and I will be specially privileged. Everywhere I go, I will enjoy divine influence and acceptability. In 2013 I will enjoy great benefits and pleasures in Jesus name. I will be graced in my going out and I will be graced in my coming in. In 2013, I will never be without the grace of God. I will be fully immersed in the grace of Christ Jesus. In 2013, God’s SUPER ability will rest upon my natural ability and I will become supernaturally progressive and outstanding. The grace of God on my life will subdue every satanic influence and misfortune in Jesus mighty name. Through the grace of our Lord Jesus Christ I will experience the true riches of God. I will encounter the grace of Jesus Christ in a practical way. The grace of Jesus Christ will avail for me in 2013. It will produce finances for me, it will produce health for me, and it will produce spiritual vitality for me and my family. The grace of Jesus Christ will influence my thinking and decision making. I will be an embodiment of the fullness of the grace of Jesus Christ. I will experience the Love of God in its full intensity. My communion with the Holy Spirit will be intimate and there would be clear communication line between us. I will not take the grace of God for granted and I will carry it with dignity. I will not be selfish with the grace of God; I will be a channel of grace to my world. The bible says blessed are the merciful for they shall obtain mercy. Therefore, I will be gracious to others and thereby increase the flow of God’s grace into my life. I will not frustrate the grace of God; I will value it and show gratitude for it. 2013 is my year of exceeding grace to prosper and reign like Christ. I have the grace I need to function in every place and position that I desire in 2013. I receive and soak- in the grace of Jesus Christ right now. Amen.